Seventh House by R.K. Narayan, is a short story that explores the extent to which a lover can go to protect his beloved. While many profess to have enduring affection, an inseparable bond, an eternal union that only death can break, the realistic Narayan surpasses them all by making the protagonist cheat on his wife, in a genuine attempt to save her from the cruel death! In essence, Seventh House is Krishna’s story with yet another point of view. The story begins at the point where Bachelor of Arts left it. But, in contradiction to the earlier climax, the hero has been able to convince his in-laws and has married the girl of his dreams, despite a fatal flaw in his kundli. He is manglik, with an inauspicious Mars eying his seventh house of marriage. The girl who marries him is bound to suffer fatal consequences. But, his love conquers all her fears and she marries him despite odds. However a few years down the line, she suffers from typhoid. The doctors have given up on her, and in a desperate bid to save her life, the non-believing husband seeks out divine help by going back to the astrologer, who vehemently opposed their match. And, strangely, he is told that it is his loyal love that is inviting greater rage of Mars. Had he been an infidel, his wife would not have suffered so much! Would he succumb to the suggestion? Would he forgo his loyalty and commit adultery in the name of eternal love, forms the basic framework of this short story. As I began reading the story, I found it has the oft-repeated theme. The subject of wife’s death and the innumerable sufferings of the husband had been done in great details in English Teacher and A Night of Cyclone. And, I thought the event though resonant of Narayan’s personal life that is often visible in his works, giving slight autobiographical touch to his stories, has been dealt in so much detail that it would hardly interest me any more. But, as I finished reading, I was again left impressed. Here, I glimpsed a possible episode, that did not make to the final edition of English Teacher. The light hearted down right stupid belief of the husband, perhaps did not fit in with the sombre attitude of Krishna in English Teacher. But, here in this short story, the subject is presented deftly. 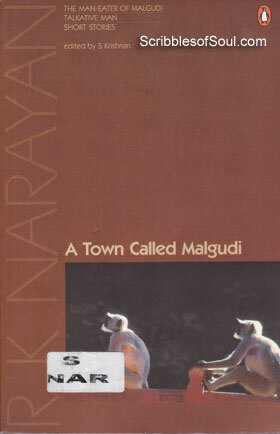 In fact, the more stories I read by R.K. Narayan, the more I realize that he is a master story teller. His stories can be combined together to form a long novel, or the best of his novels could be summarized in the shortest of the stories. He successfully juggles the long prose and short drama skilfully. The story may be called a satire, a tongue-in-cheek comment on the foolishness of innocent desperate people, who become easy victims of fake babas and money mongers, exposing once again Narayan’s disbelief in the Astrologers, or it may be seen as a genuine last attempt by a drowning man, who hopes to stay afloat on a blade of grass! But, all in all yet another feather in the cap.